Beverly: Bobby Ring, 7, at left, and his brother Thomas, 5, jam on their cardboard guitars along with "All Together Now" guitarist Bruce Hilton during the first weekend of the Beverly Homecoming festival in Lynch Park. Photo by Mary Catherine Adams/Salem News. 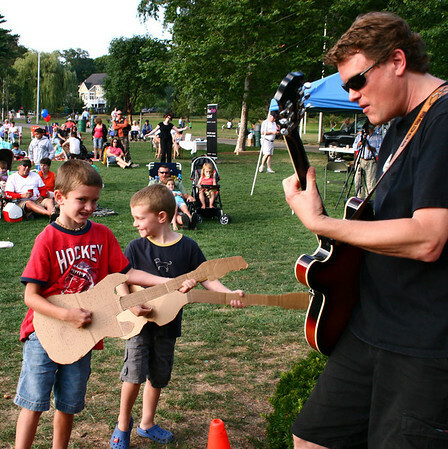 , Beverly: Bobby Ring, 7, at left, and his brother Thomas, 5, jam on their cardboard guitars along with "All Together Now" guitarist Bruce Hilton during the first weekend of the Beverly Homecoming festival in Lynch Park. Photo by Mary Catherine Adams/Salem News.